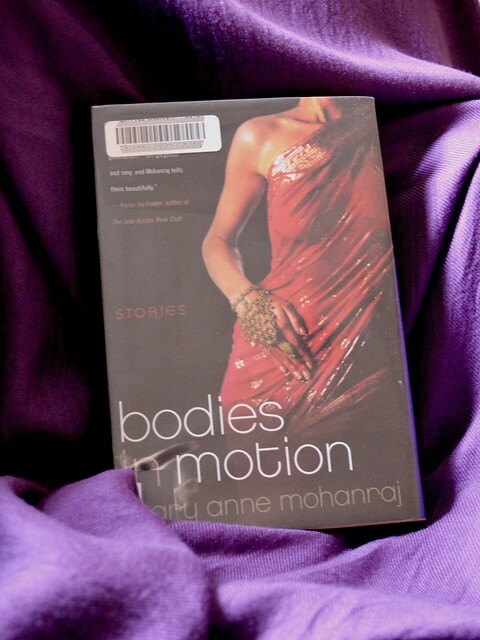 My latest reading project rolls on with Bodies in Motion by Mary Anne Mohanraj (published in 2005). The collection turned out to be a kind of a family chronicle with interlinked or related short stories. Mohanraj herself calls it, aptly, a novel-in-stories. The stories follow the lives of two families over 60 years, but each piece focuses on different, occasionally recurring characters. There are twenty stories, presented chronologically and grouped into six sections including beginnings, interlude and epilogue. The locations vary from Sri Lanka to England to U.S. and back again. In the background, there are political tensions between Tamils and Sinhalese in Sri Lanka, with the threat of violence propelling characters to action in some stories. In the foreground, there’s the clash between family and individual, and/or traditional and colonial, and/or traditional vs. immigrant expectations and experiences, especially with regard to arranged marriages and finding love or fulfillment. The individual stories are shortish, subtle mood pieces. Rather than concentrating on plot, Mohanraj offers us glimpses of her protagonists’ lives through their decisions and emotions. Occasionally we also see one event through more than one characters’ eyes, which was an interesting choice and convincingly carried out. I was impressed how effortlessly Mohanraj created such distinct individuals. Even so, keeping track of the characters’ relationships to each other was sometimes difficult; the two family trees at the beginning did help. Despite my general preference for novels over short stories, I found Bodies in Motion, like The Ship Who Sang, to be a very successfully built collection. However, when I chose Bodies in Motion for this project, I somehow missed that it isn’t SF/F or speculative. I didn’t mind, though, for I fell in love with Mohanraj’s writing pretty much immediately. Her language is sensual, beautiful and nuanced. The stories are also spiced (if you’ll pardon the expression) with detailed, tempting descriptions of Sri Lankan food. An additional note: Mohanraj was born in Sri Lanka but has lived most of her life in the U.S. As an immigrant to the U.S. myself who’s moved here only relatively recently, I found the collection really interesting and helpful in fitting my personal experience into a larger context.